Museu Picasso is one of the most popular and most visited museums in Barcelona, housing one of broadest collections of Picasso’s works. In 1885 Pablo Picasso’s family moved to Barcelona and this is where the painter would then spend is formative years and professional life. Picasso is now one of the most recognized figures in 20th century art and is an integral part of the Barcelona art culture. Picasso was a Spanish artist, draughtsman and sculptor who lived from 25 October 1881 – 8 April 1973. He is best known for co-founding the Cubist movement and for the wide variety of styles embodied in his work. The Museu Picasso in Barcelona has a vast collection of his works; from the beginning right through to the end of his career. 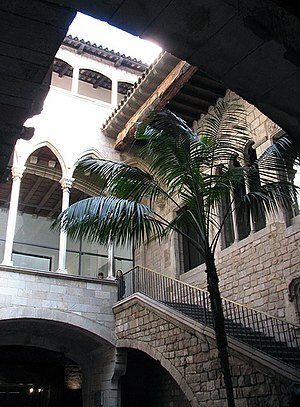 The museum is housed in five adjoining medieval palaces in Barcelona’s La Ribera. The Museu Picasso has one of the most extensive collections of art works by the 20th century Spanish artist. It is one of the most popular and most visited museums in Barcelona. Jaume Sabartés, Picasso’s lifelong best friend, came up the idea for the gallery. Sabartés had a lot of paintings, drawings and prints which Picasso had given him. Originally Sabartés had planned to set up a museum based on his collection in Málaga, Picasso’s birthplace. It was Picasso himself who suggested that Barcelona would be more appropriate, given his long standing connections with the city. The museum first opened in 1963 and the original collection was made up of the 574 works that Sabartés donated and the items that Picasso had previously given to the city of Barcelona, as well as those that had previously been in the possession of the city’s museum of modern art plus other gifts from Picasso’s friends and collectors. After Sabartés death in 1968, Picasso himself donated a large number of items to the museum, including approximately 1000 items of his early work which his family had been keeping for him ever since the time he first settled in France. This included school books, academic pieces and paintings from Picasso’s Blue Period. There are now more than 3,500 works making up the permanent collection of the museum. The works have been exhibited in a chronological order, with clear recognition of how Picasso’s style evolved throughout his career. Picasso museum of Barcelona is crucial to understand and study the shaping years of the ever genius youthful artist divulged in more than 3,500 great works of the great man that have made the permanent collection of museum, making it the world renowned. The museum gives the detail story of the Picasso’s attachment with the Barcelona. Museu Picasso exhibits Picasso’s works in periods, such as the Blue Period, the African influenced period, Rosa period, Synthetic cubism and Analytic cubism. This museum also gives the details of the Picasso’s return to classicism from Cubism and his journey to Rome with his first wife. The museum has an excellent collection of Picasso’s cubist and blue period works. These include Blanquita Suárez, Figure with Fruit Dish, Harlequin and Woman with Mantilla. The Picasso Museum in Barcelona is located on Montcada Street in the heart of the city. If you’re getting to the Picasso Museum by bus then bus numbers 14,17,39,40,45 & 59 all stop close to the Museum. Underground stations that are within walking distance to the museum include Arc de Triomf station, Liceau Station & Jaume I Station which are on the red, green and yellow lines respectively. Once you get out of the station the Picasso Museum is signposted. The Picasso Museum in Barcelona is closed on Mondays. From Tuesday to Sunday the museum is open from 10 am until 8 pm. In addition, there are several public holidays in Spain on which the museum is closed. Apart from New Years Day and Christmas these include May 1, June 24 and December 26. Standard tickets for the Picasso Museum cost €6 which provides entrance only to the permanent exhibitions. Tickets from temporary exhibitions staged at the museum cost €5 and a combination of the both gets you a slight discount at €8.50. Tickets stop being sold half an hour before closing time. This entry was posted in Art and tagged Art, Art exhibition, Artist, Barcelona artist, Catalonia, Catlan artist, Pablo Picasso, Spain, Spanish artist by Harriet Copeman. Bookmark the permalink.